Alterations in the course of global history are often brought about by obscure innovations that have locked within them great but unappreciated potential. Such was the case nearly 1,000 years ago when the world was introduced to a unique and nearly mystical compound known simply as poudre. In his new book Gunpowder — Alchemy, Bombards & Pyrotechnics: The History of the Explosive that Changed the World, author Jack Kelly provides a detailed examination of this remarkable concoction as complex and explosive as the titular subject itself. The book handles its topic in a manner simultaneously comprehensive and approachable. Shattering the many misconceptions surrounding this often-misunderstood compound, Kelly's writing flies forward with the power of a cannonball. Kelly's history of gunpowder begins, predictably, in 10th Century China where Oriental alchemists revealed the combustible potential of a new "fire drug" in their search for an elixir of immortality — a remarkably flammable blend of sulfur, saltpeter and honey. (The last of the three provided a weak source of carbon that, when eventually replaced with charcoal, yielded a much more potent explosive.) Contrary to the popular myth that gunpowder was never realized as a weapon in Asia, Kelly shows how the Chinese frustrated Jurchen and Mongol invaders in the 12th and 13th Centuries using rockets, primitive flame throwers called "fire lances", and history's first cannons, which the Chinese termed "erupters". Kelly then follows gunpowder's smoky course from the Orient into Europe, where we quickly appreciate the vast effects this earth-shaking invention had on the world of the Late Middle Ages, the Renaissance and the Early Modern period. Not only did gunpowder render the cultural icons of medieval Europe — the knight and the castle — essentially obsolete, it blasted its way into nearly every aspect of Western society in the 15th and 16th Centuries, from science and art to politics and economics. From the Battle of Crecy in 1346 (possibly the first use of gunpowder on a European battlefield) to the fall of Constantinople and the French incursions into Italy in the 15th and 16th Centuries, Kelly's book reveals how marginal innovations, such as trunnions, iron cannonballs and corned powder, provided kings and generals with battle-winning advantages as they sought to put gunpowder-powered weapons into ever more central roles in warfare. Kelly also explores the surprisingly diverse non-military developments sparked by gunpowder. Politics were forever altered as monarchs consolidated their authority to achieve the resources needed to equip standing armies with cannon and muskets, sweeping away the remnants of feudalism. Notions of science replaced mysticism as scholars began to understand gunpowder's potency as a chemical reaction rather than a product of the four elements of alchemy. Philosophers, long trained to look toward the wisdom of Aristotle and Plato as the only valid source of knowledge, sought to reconcile their understanding of the universe in light of a wholly new discovery. Even the worlds of art and literature were affected as gunpowder was used to fuel staged special effects in Elizabethan England, drawing ever-larger crowds to the productions of Shakespeare and Marlowe, and providing dazzling possibilities in new displays of fireworks — a new type of after-dark entertainment so popular it moved Handel to write a sweeping musical accompaniment. Secular questions, too, were raised by the ever-increasing use of gunpowder in the 16th and 17th Centuries: Could this technology that produced smoke, fire and thunder (three things long thought to be associated with the Underworld) be used without the risk of eternal damnation? Kelly's history of gunpowder also explores applications on the high seas as he steers his remarkable narrative into the waters of the Age of Sail. Sail-rigged merchant ships, previously too slow and ponderous to match the military potential of oar-powered galleys for battles at sea, were transformed into fearsome vessels of war when mounted with banks of cannons. The futility of the Spanish Armada becomes apparent as Kelly depicts the disparity of tactics made possible by gunpowder: Elizabeth's ships were unleashing cannonades against Spanish captains relying on the outdated doctrine of closing for boarding maneuvers; the Duke of Medina Sedona, Spain's naval commander in 1588, might have been the one who coined the axiom, "Don't bring a knife to a gunfight." Although much of Kelly's Gunpowder is set in the European theater, the scope of his book extends far beyond those boundaries. He follows the reintroduction of gunpowder weapons into the Orient, where the rulers of Japan, China and India struggled with the effects of a familiar technology transformed into an alien tool of conquest. He also reveals the array of beneficial, non-military applications of gunpowder, from mining and industrial production to mathematics and engineering — pointing out, as perhaps the greatest of these, that Isaac Newton used the model of a cannonball in flight to develop his world-changing law of planetary motion. 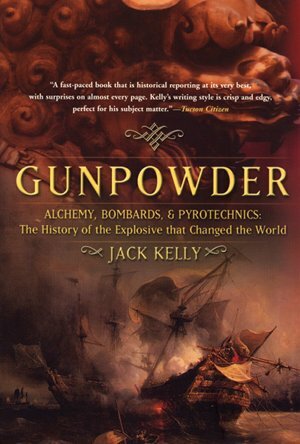 As America assumed a place on the world stage, Kelly reveals the crucial role gunpowder played in the cause of revolution — from the midnight ride of Paul Revere to the "shot heard round the world", the events of the War of Independence focused largely on American colonists defending their precious stores of gunpowder from British seizure. America's alliance with France became a lifeline as the Du Pont family brought cutting-edge French powder milling techniques to Delaware, where the family's powder-making innovations fed America's growing need for materiel throughout the 19th Century. By the time of the American Civil War, as vast improvements in weapon design demonstrated the tragic obsolescence of battlefield tactics that had changed little since the days of Napoleon, gunpowder too began to strain against the limits of its abilities, and a new wave of innovation was launched in the search for an artificial "smokeless" propellant. As Kelly looks at the contributions of modern chemists such as Schonbein and Nobel, his chronicle of mankind's first experience with "artificial fire" comes to a satisfying conclusion. Jack Kelly's prose is smooth and gripping, more reminiscent of an adventure novel than a work of nonfiction. The bright narrative is liberally sprinkled with quotes from towering figures of history such as Francis Bacon, Galileo, Robert F. Stockton, Victor Hugo, and Gengis Khan, giving Kelly's book a truly epic perspective. Gunpowder — Alchemy, Bombards & Pyrotechnics is replete with images of clanking medieval armies rolling primitive bombards across the countryside of France, creaking tall ships with gleaming brass cannon barrels protruding from their gun ports, and ranks of uniformed soldiers standing ready to volley with muskets to shoulder. Whatever period of history fascinates you, this is one of the rare books that sets the events of the past ablaze and demonstrates how many explorers, adventurers and innovators throughout the ages have, as Shakespeare said, "sought (and found) the bubble reputation in the cannon's mouth".